The Alano Club provides a doorway to employment and sober living for many volunteering in the the Alano Club’s Proof of Performance Program. Many organizations benefit by including our website in their company newsletter. Educate your company employees about The Alano Club. You never know who may need help staying clean and sober. A drug or alcohol treatment center costs a company $10-20K. The recidivism rate for recovery without a doorway to sober living is very high. How much work time is lost to hangovers and sick days when an employee has an alcohol or drug problem that goes untreated? How much money does lowered productivity cost; caused by the lack of physical and mental alacrity due to drugs or alcohol consumption after hours? How many L & I claims are related to drug or alcohol use on the job? Brandie divorced after being a "stay at home Mom" for 20 years and found herself single and unemployable. She applied for many jobs that she felt she was qualified to perform. But she couldn’t get a job because she didn’t have a resume with recent employment experience. Accepted and processed Alano Club Membership and Volunteer applications. Customer service tasks i.e. taking customer orders, accepting payment in cash and/or credit card for purchases. Administrative Assistance i.e. training and directing other volunteers to serve customers at the Bar, and perform general cleaning and maintenance tasks. Opening and/or closing the Club at 9am or 9pm, or midnight on Special Event nights with all security procedures completed. Assisted the Manager in decorating for Special Events and maintenance, organized supplies, produced signage for events. Answered the phone and provided information about The Alano Club, AA and other 12 Step Recovery Programs meetings schedule. Brandie was glad the Club is here so she could achieve a viable work experience record on a resume. When the DVR assessed her work ability in a 30 day trial period at Goodwill Industries, they decided she was over qualified because intellectually she didn’t need as much help as others. They said that she was an adaptable, hard worker. The Alano Club is the only recovery club in Spokane with a POS system and a Volunteer Training Program that results in a Proof of Performance Job History. Brande became qualified to work in restaurants, as a barista, in retail sales, as a receptionist, and in janitorial and housekeeping services. Her professional conduct towards clientele was honed by her carefully supervised training at The Alano Club’s Coffee Bar. Brandi enjoyed the safe friendly environment that working at The Alano Club provided. A Giant shout out to Penee Paine for selling over $900.00 in tickets Roger Zarowny for $300.00 The Baristas at the Coffee Bar $500.00 our total reached just over $1700.00 for this outstanding fundraising event. Please support the sponsors below for helping make this possible. This is just one of the rooms that Club Members can use. Private meetings, watching the game on the big screen, relaxing with friends, playing card games,....it's a little bit of home away from home. After the treatment center comes The Alano Club, a place to hang out, attend meetings and meet new friends. The Alano Club makes the transition to a sober lifestyle easy. Here is a little bit of our history. This page is from a newsletter from 1953. Back in 1945 Curt S., who had enjoyed AA meetings in Minneapolis, came to Spokane and found none here. Feeling the need for a group, he put an ad in the newspaper. The Davenport Hotel donated a meeting room and the first 12 Step Recovery meeting was held in Spokane WA. That was a long time ago. Today AA and The Alano Club are separate organizations due to the 12 Traditions of AA. However, they still work hand in hand to bring hope and a healthy lifestyle into many lives. 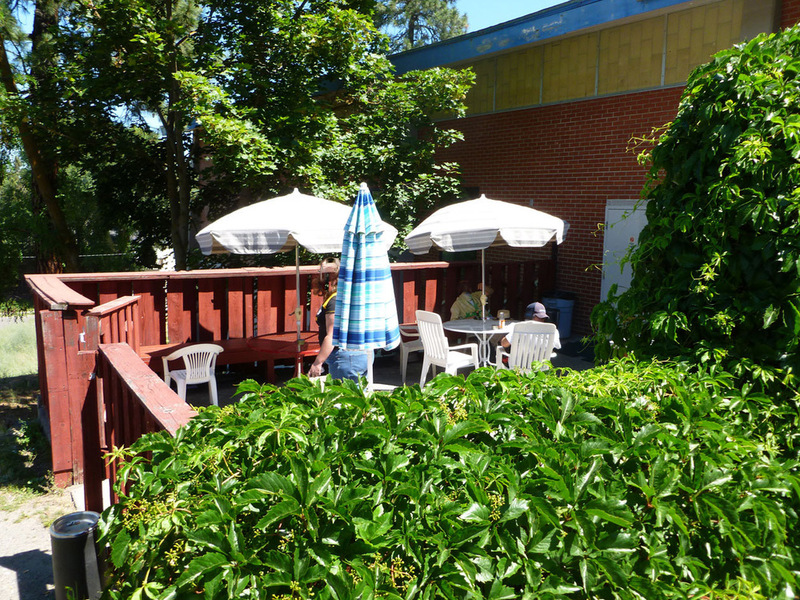 With ample parking and room for events and meetings, the Alano Club also has a Cafe, Expresso Bar, Game Room, and outdoor gas BBQ grill on the patio. All 12 Step Recovery programs are welcome here.